That morning on the 26th of December everything changed. Paradise exploded into a fury of raging water and the unbelievable became true. When the ocean reached us on the second floor in our bungalow on the beach, the raw powers of nature became obvious. The house disintegrated all around us and we were flushed out through the stone walls. I was holding Ragnar in my arms as we were thrown inland travelling 8-10 meters above ground, on top of the wave in a speed of 40 km/h. Ragnar was scared and shouted “Daddy, Daddy, Help! Heeelp!” After a couple of hundred meters Ragnar was torn out of my arms and he drifted away from me, floating on his blue swim bands. This was the last we saw and heard from Ragnar, after that we do not know what happened to him. Ragnar was 2 years and 8 months old. Ragnar was a mature and caring person in spite of his young age. He was the kind of boy who always smiled. Ragnar started his day in kindergarten by hugging all the other children. He was clearly concerned for other people’s well-being and was always giving and sharing. Through the Ragnar`s Care Foundation we can make sure that Ragnar's caring spirit lives on by providing for other children in need. 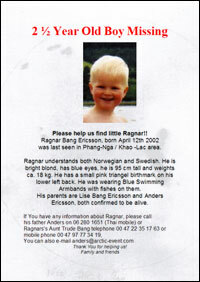 We can no longer do this for Ragnar, but we can do it for others. This work is one way to bring life back from the darkness of a meaningless disaster. My wife, Lise Bang Ericsson, was flushed 2 km. inland and survived this first day in the jungle. I found myself sitting in a tree 6 meters above ground a couple of hundred meters inland. It took 3 hours before the water pulled back into the sea. My wife and I were reunited 36 hours later.